Most great stories have a beginning, middle, and end. When it comes to the story of Virginia’s efforts to end Veteran homelessness, we started with the end in mind – a vision of a Virginia where Veteran homelessness, when it does occur, is rare, brief, and non-recurring. THE BEGINNING – DEFINING THE CHALLENGE, GETTING ORGANIZED! In the summer of 2013, the Department of Veteran Services and Virginia Coalition to End Homelessness partnered with the VA VISN Network Coordinator, Jeff Doyle, and local leaders in communities to hold a statewide Veteran homeless summit. This event marked the beginning of increased collaborations among federal, state and community partners. 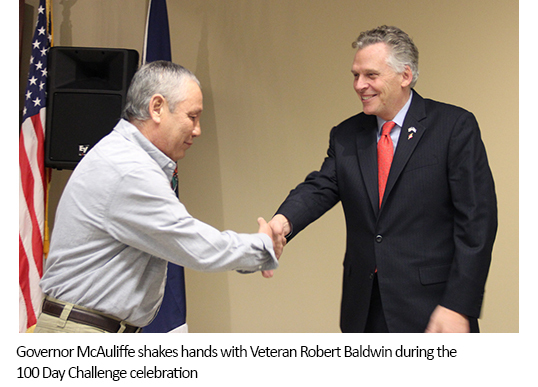 We believed that ending Veteran homelessness in Virginia was not an impossible task. The goal of our effort was supported by the Governor’s Coordinating Council on Homelessness, which includes representatives across state agencies that play a role in addressing homelessness as well as local providers, nonprofits, and other community leaders. Our focus was to unify mainstream and Veteran specific housing and services while continuing to shift to housing first statewide. The success of this endeavor relied on leveraging existing partnerships with the US Department of Veterans Affairs (VA) and the Department of Housing And Urban Development (HUD) that the Virginia Department of Veteran Services (DVS) had nurtured. Along with federal agencies, DVS built on partnerships with VA Medical Centers (VAMCs), SSVF providers, and the VASH programs. Also paramount were the relationships that the Virginia Coalition to End Homelessness (VCEH) has with local Continuums of Care (CoCs), including nonprofit housing and homeless providers, local jurisdictions, and other mainstream providers involved with local homelessness planning. As a state, we recognized that the available data on Veteran homelessness had its limitations and that we needed to have a better sense of the scope of homelessness among Veterans. The state collected annual data from Continuums of Care about Veterans that had accessed the local homeless systems to pinpoint needs around the state. Armed with this data, we could paint a clearer picture to VAMC directors and staff, CoC leadership and members, and key state leadership. This effort mobilized members of the Governor’s Coordinating Council on Homelessness, including agencies like the Virginia Department of Housing and Community Development and the Virginia Housing Development Authority. As a result, ending Veteran homelessness in Virginia became both a call to action and a feasible and urgent challenge to overcome. THE MIDDLE – GETTING MOBILIZED! In June of 2014, VCEH and DVS, with the support of private donors, brought together local, state, and federal leadership to discuss solutions and concrete actions. The ideas from the summit were formalized into a State Action Plan on Veteran homelessness that was subsequently endorsed by the Governor’s Coordinating Council on Homelessness. In addition, Virginia Governor Terry McAuliffe signed on to the Mayor’s Challenge and committed his administration to working towards ending Veteran Homelessness by the end of 2015. Having the public support of state executive leadership at the highest levels in addition to an action plan, informed by local leaders in communities across Virginia, channeled the momentum into action. 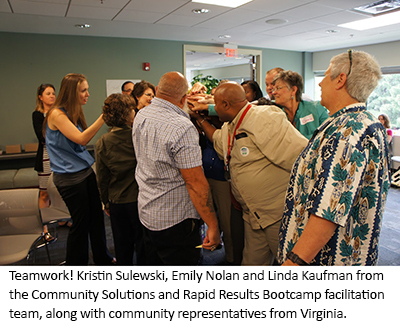 An alignment of local, state, and federal priorities led to a willingness to participate and invest in a Rapid Results Institute/Community Solutions Boot Camp by four communities in Virginia with high rates of Veteran homelessness. The communities challenged themselves to house 370 veterans in 100 days and laid the groundwork for an integrated system that would more effectively address Veteran homelessness. Locally, CoCs, housing and homeless service providers, public housing authorities, and VAMCs shared promising practices with each other and improved practices through increased communication. Importantly, each community created coordinated outreach to identify every Veteran in their community experiencing homelessness by name in order to design a response that met their needs. With support from HUD and the National League of Cities, an additional 15 local elected officials signed on to the Mayor’s Challenge. Local leaders worked to knock down the walls of communication between the public and private sectors and rally around a new way of working together. In response to challenges identified on the front line, the state worked with federal partners such as the USICH, HUD, and VAMCs to streamline processes and quickly address the barriers communities were facing during the 100 Day Challenge. DVS and VCEH helped to coordinate the continued collection and evaluation of data, facilitate communication across local, state and federal partners, listen to our partners on the ground about what was working and what wasn’t, and provide technical assistance to communities throughout Virginia. Over the course of the 100 Day Challenge, significant reductions in the turnaround time for HUD-VASH and SSVF were achieved and communities doubled their average monthly housing placement rates for Veterans. Ultimately, through this process, communities were able to align and leverage an additional estimated $1,000,000 in housing choice vouchers and rapid re-housing assistance for Veterans. On February 5th, community leaders, DVS, VCEH, Governor McAuliffe, and cabinet members who sit on the Governor’s Coordinating Council on Homelessness, celebrated that we had exceeded our goal and connected 462 veterans to housing during our 100 Day Challenge efforts! THE END – SUCCESS IN 2015! This is by no means the end, but the beginning of something transformative. The number of Veterans connected to housing in the first 100 Day Challenge represents two thirds of our 2014 point in time count! Imagine what we can do over the next 100 days, and the 100 days after that! We also have improved the way we reach out and identify veterans and will continue to assess and evaluate progress as we move forward and learn more. Expertise lies within the communities to reach the goal to end Veteran homelessness, and as a state, we will continue to bring representatives from every community together to collect data, exchange best practices, evaluate progress, and address any new barriers that present themselves as we work towards ending Veteran homelessness. And that’s what will be critical to Virginia’s success – staying grounded in the need and responding with urgency. We will have to continue to mobilize more partners and resources at every level of government and in the private sector to address Veteran homelessness and create solutions, particularly for non-VA eligible Veterans and Veterans in rural areas. When we all focus our energy and efforts on the desired outcome, we can work through the setbacks and challenges and do amazing things – like seeing an end to Veteran homelessness in our lifetime and for generations to come. We are looking forward to a new beginning for all Virginia Veterans who are faced with a housing crisis. Jill Fox is the Deputy Director, Virginia Coalition to End Homelessness, and Matt Leslie is the Director of Housing Development for Veterans, Department of Veterans Services.